The longest sentence went to the crisis coordinator who was sentenced to two years and 10 months in jail. A COURT IN Italy has convicted five employees of an Italian cruise company for the Costa Concordia shipwreck that killed 32 crew and passengers after it accepted their plea bargains. The longest sentence went to the crisis coordinator for Costa Crociere SpA, the cruise company, who was sentenced to two years and 10 months. Concordia’s hotel director was sentenced to two years and six months while two bridge officers and a helmsman got sentences ranging from one year and eight months to one year and 11 months. The plea bargains were handled separately from the trial of Costa Concordia Captain Francesco Schettino, who is charged with manslaughter for causing the January 2012 shipwreck off the Tuscan island of Giglio and abandoning the vessel with thousands aboard. That trial opened this week. The Concordia, on a week-long Mediterranean cruise, speared a jagged granite reef when, prosecutors allege, Schettino steered the ship too close to Giglio’s rocky shores as a favor to a crewman whose relatives live on the island. If found guilty, he faces up to 20 years in prison. Schettino has denied the charges and insisted that the rock was not in nautical maps. The reef sliced a 230-foot gash in the hull. Seawater rushed in, causing the ship to rapidly lean to one side until it capsized, then drifted to a rocky stretch of seabed just outside the island’s tiny port. Survivors have described a delayed and confused evacuation. The bodies of two victims were never found, but they were declared dead after a long search. 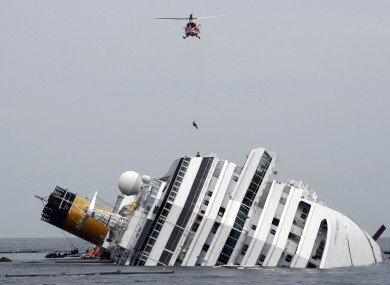 Email “Italian court jails five over Costa Concordia ship disaster”. Feedback on “Italian court jails five over Costa Concordia ship disaster”.